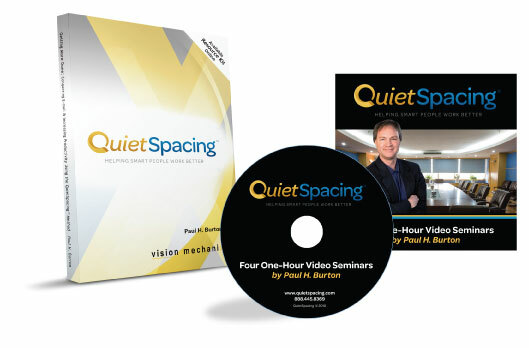 QuietSpacing® is an revolutionary way to effectively manage the frenetic nature of modern life. Born from the need by people for a better way to stay abreast of their busy lives, QuietSpacing® lays out a simple way to organize, track and complete everything you have going on in your world. The QuietSpacing® implementation workbook (applied in Microsoft Outlook 2003 & 2007) teaches you a new way to view how you interact with your work, with your technologies, and with others. It goes further, though, providing a step-by-step guide to implementing the strategies and behaviors necessary to increase your productivity and sense of control and satisfaction over your personal and professional worlds! The foundation of the methodology is recognizing that there are only four types of stuff that we deal with each day. Coupling this simple classification system with four-step process for managing your work greatly improves your processing speed and effectiveness. The icing on the cake comes from the dozens of QuickTips embedded in every chapter that reduce the interruptions and distractions you suffer and further increases your productivity. Find out what hundreds of people have already learned about how to increase your productivity and regain control over your work day. Is bombarded by interruptions and distractions throughout the day. Wants to conquer their e-mail, schedule and/or task list (especially for those working in Microsoft Outlook 2003 or 2007). Interacts with others during the day. Seeks to command their work environment. Craves a stronger sense of accomplishment and control over their lives. The 110-page book, which includes step-by-step instructions and dozens of screen shots of Microsoft 2003 and 2007. The DVD containing all five one-hour video seminars, complete with instructions and screen shots. A combination of the book and DVD to enhance your learning experience. If you’re just not ready to purchase the QuietSpacing® book and/or DVD yet, maybe this will help you decide. Below is a link that will let download the first chapter of the book! Choose the products you want and we’ll send them out immediately. Shipping and handling charges apply.